Editor’s Note: Every Wednesday at 10:30 am CT, Adam and Lindsey host a live Girardian Virtual Bible Study following the Sunday lectionary on the Raven Foundation Facebook page. We invite our listeners to join the conversation with comments and questions. I take some notes to help me prepare… and share them with you to help you do the same! This is the Girardian Virtual Bible Study preview! Hosanna, Hey Sanna, Sanna Sanna Ho… Sanna Hey, Sanna Ho-san-ah! Hey JC! J-C! You’re alright by me! Sanna Ho, Sanna Hey, Superstar! This is the Palm Sunday processional that rings in my ears and my heart as Holy Week overtakes Lent and our journey to the cross nears its destination. Andrew Lloyd Webber’s lyrics may sound glib or fickle, but that very fickleness alludes to the shift in tone that will take place over the course of the week as the palms give way to the Passion. For now, however, there is honor and celebration as Jesus enters Jerusalem. The people wave their branches. They spread their cloaks along the way. They shout “Hosanna” and sing praise as their king comes out to meet them, to lead them… riding on a donkey. This is the most subversive royal processional ever. And I wonder if the people understand this. Surely they could not have missed the fact that Jesus is not coming to them on a noble steed but on a humble beast of burden — a young one, at that! (So, he would be even lower to the ground. Hardly the grand entrance!) Did they think he would later trade in his donkey for a war horse? But if I distance myself from the crowd, I miss the point. I could — I can — I do — fall into these crowds where hope on the one hand and fury on the other are each magnified by the crowd, like a hall of mirrors illuminating and multiplying our passions. Being swept up in the moment, finding belonging in the mass of people where emotions flow like a river and it’s nearly impossible to stand against the current… this is part of being human. And the collective violence that falls upon Jesus on Good Friday often starts out as collective hope thwarted or disappointed. The pattern of collective accolade to accusation is nothing new. The pattern of collective accolade to accusation is nothing new. The hope is genuine. In fact, I believe the crowds are sincere in their praise of Jesus. Among the people waving their palms, spreading their cloaks and shouting their joy are probably those Jesus has healed, those he has fed, those who have received his words as good news. Those who for so many years had felt themselves locked out of the community — the marginalized and excluded — are now restored to society. I believe they are truly grateful. “Open to me the gates of righteousness, that I may enter through them and give thanks to the Lord,” as Psalm 118 says. Jesus’ triumphal entrance is also theirs, for they who have been on the margins are now at the center. They feel themselves caught up in something monumental. Something is about to happen… a change is coming. They are right! But this change is beyond what they can yet imagine. We can’t help but see the Crucified One in these words. But before Jesus has been crucified, the crowds that gather may see themselves this way. Those most grateful to Jesus, those who place the most hope in him, are those who see what he has already done to restore them. Those who were once rejected now see themselves as integral to this new thing that is about to happen. But do they yet recognize what it will take to restore the whole world? See, from the beginning of time, humanity has found its identity over and against others. Unity has been created at the expense of those cast aside or fought — scapegoats or enemies. People deemed unclean or unworthy were dehumanized, while those who excluded, exploited or oppressed them could not recognize their own evil because they saw themselves as the “good guys” over and against their enemy others. The multitudes who come to Jesus in hope and gratitude have seen how others have thrived at their expense. Now they have been brought into the fold from the margins. Some have had their physical bodies restored, but the healing of their individual bodies is just the beginning, the personal reflection of the collective healing that comes from restoring outcasts into the community. But, ultimately the community is still oppressed at the hands of Rome. So the question is, do those who have been restored to health and reintegrated into their communities recognize that the circle of healing is meant to widen until all the world is gathered as one community, or do they believe that they have been brought together to fight a greater enemy? How can we blame them for believing the latter? Don’t we do the same? Aren’t military and diplomatic alliances based on the premise that nations have not only mutual interests but also mutual enemies? Might these crowds have felt a sense of hope that they might be on top, for once, instead of on the bottom? Because isn’t there always a top and a bottom? How do we know ourselves if not by the fact that we are not them? Jesus wants us to know ourselves and one another in a completely different way. He wants us to recognize ourselves in each other and live for one-another. Therefore, he will not be the warrior for whom the people long. Their hope will turn to disappointment. It is not so much out of bloodlust as out of a desire for survival, for life. They only know the life that comes from the expense of others, even if it has been the life of others at their expense. The life Jesus will give will be something entirely new. He has come not to defeat others, but to undergo the defeat we inflict upon ourselves when we live according to the ways of death that say we must kill or be killed. In rising, he will defeat death itself, and build a new world on a foundation not of violence and exclusion, but on connection and relationship. Jesus’s outstretched arms will embrace the whole in love. But before he stretches out his arms, he rides in, and people project their expectations onto him. What expectations do we project onto Jesus? Onto our leaders? Do the weight of our hopes become a cross of condemnation when they are too heavy to shoulder alone? Do we hear the ominous warning behind the pomp and pageantry? There is so much still to unpack. And I, for one, will be unpacking my Jesus Christ Superstar DVD in preparation for Holy Week. But even moreso this year, I am looking forward to our Palm Sunday Girardian Virtual Bible Study tomorrow at 10:30 CT on the Raven Foundation Facebook page. Please join us! 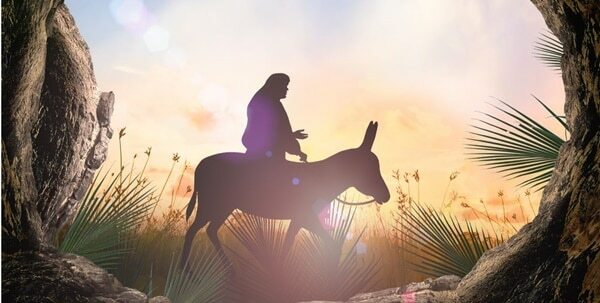 Image: Palm Sunday Concept from 123rf.com.